The H. Upmann The Banker Basis Point #2 is tagged with free shipping. If you order this product, your entire order will receive FREE BCP Ship Saver shipping! In 1844, German bankers Carl and Herman Upmann traveled to Cuba to create an exceptionally unique cigar and locked it away only to be gifted to their most special clients. After nearly 170 years, that original blend has finally resurfaced. Decadently dark, rich, and robust, The Banker boasts an earthy and toasty, sophisticated smoking profile. 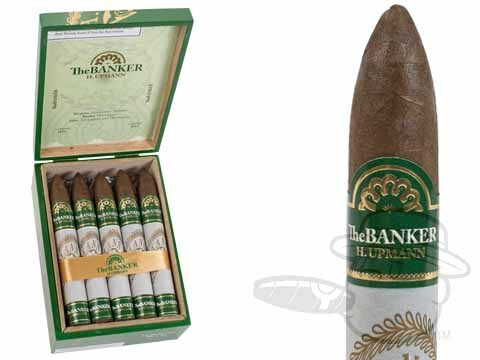 Using an aged Ecuadorian Habano wrapper, a Nicaraguan binder from the Jalapa region and aged Nicaraguan and Dominican fillers, The Banker is smooth in full flavor with lush notes of coffee and spice. What's there to say, H.Upmann delivers another great smoke. Tight rolled, slow burning, average taste. H. Upmann The Banker Basis Point #2 is rated 4.9 out of 5 based on 4 customer ratings.